A century-old Dublin city flat complex, that was to have been redeveloped by social housing body Cooperative Housing Ireland, is to be given by Dublin City Council to a property investment firm. 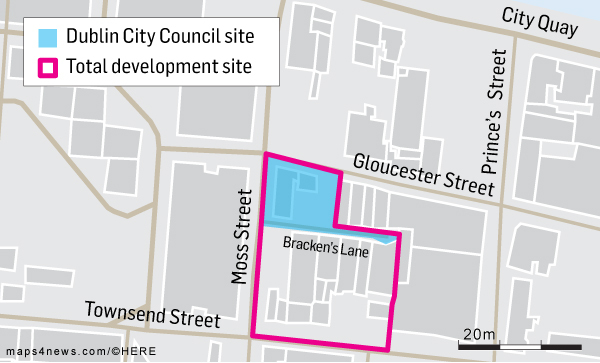 Brigante Investments, a subsidiary of Tetrarch Capital, wants to redevelop the site of the Moss Street flats, close to City Quay in the south east inner city, as part of a hotel, retail and office development on an almost one acre site. In return the council will get 20 new apartments and a retail unit at no cost, and an additional apartment at market value. The Moss Street flats were completed in 1917 and were, along with identical buildings on nearby Luke Street and Townsend Street, among the earliest purpose-built social housing in the city. They were built in response to that era’s housing crises, marked by worsening slum conditions in tenement houses which came to a head in 1913, when the collapse of two houses on Church Street killed several tenants. The red-brick building on the corner of Moss Street and Gloucester Street, one block east of Tara Street railway station, has been derelict for more than a decade, following the council’s decision to move tenants out in the early years of the last decade because the accommodation did not meet modern living standards. An independent building survey it commissioned in 2007 said the complex could be reused after a significant upgrade, but no progress was made. In 2013 Nabco, now renamed Cooperative Housing Ireland, said it would be willing to take on the refurbishment. Preliminary plans were drawn up which would see the flats retain their original facade with an extension to the rear to provide 30 new apartments. These would be offered to tenants from the council’s social housing waiting list. At the time the cost of the work was estimated at about €2.2 million. This turned out to be extremely optimistic: the flats had deteriorated significantly since the 2007 survey. The project appeared to have been shelved, but it reappeared last year with a budget of €5.5 million for 19 apartments, as part of a social-housing funding plan announced by the then minister for the environment Alan Kelly. However, the council has now decided to pursue the redevelopment of the flats through the private sector. The decision has been approved by local councillors and will be put before the full council next month for ratification. Brigante will then be required to apply for planning permission and must start work on the apartments within six months of receiving permission. The council said it understands the social housing apartments will be the only housing on site and that the majority of the rest of the plot, which runs from Gloucester Street to Townsend Street, will be taken up by a hotel. While previous plans proposed the retention of the facade of the 1917 building, Brigante could seek to fully clear the site as the building is not a protected structure.